Mayor Bill de Blasio and PBA union have reached new contract agreement, ending years of rancor. 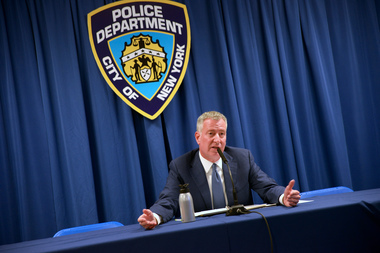 NEW YORK CITY — The city’s largest police union has reached a new contract agreement with City Hall that is larger than the package provided to the other labor unions, signaling a reconciliation between New York’s Finest and Mayor Bill de Blasio as he enters a re-election year. As part of the deal, all patrol officers will have body cameras by the end of 2019 and will receive an additional pay bump for implementing the city's community policing efforts. The Patrolmen’s Benevolent Association and its 23,810 members have been working without a contract for five years. The agreement provides retroactive increases of 1 percent for 2012; another 1 percent for 2013, 1.5 percent for 2014; another 2.5 percent in 2015, and a 3 percent raise to kick in for 2016. Wages will rise 11 percent over seven years after the two-year arbitration decision of 2015 is factored in. The cost of the contract is $530.4 million but city officials say there will be $193.7 million as part of its health care savings and stabilization plan. Those pay raises are in line with those given to the other uniformed services. The deal also includes promises from the city to support legislation to fix inequities in the NYPD disabilities agreement. But in March, the NYPD officers will also receive another bump in their base pay of an additional 2.25 percent, which the city is treating as bonus for their efforts in neighborhood policing. The 2.25 percent pay differential for community policing will be offset by a reduction in the maximum salary for new officers. The top pay for the first 1 1/2 years is $42,500 and rises to $85,292 after 5 1/2 years. "This contract resolves problems and puts money in our members pockets so they can focus on policing," said Patrick Lynch, the union president. "It worked for us and puts us on he road for a market rate of pay." De Blasio would not go into the financial specifics of the contract at the press conference even though Budget Director Dean Fuleihan and Director of Labor Relations Bob Linn were present. The mayor told reporters they'd get a fact sheet after the press conference in the Blue Room was over. But the mayor praised the deal as "something that is healthy for the city of New York." The deal now means that 99 percent of the city's labor force is under contract including the entire uniformed union workforce. When de Blasio took office, none of the workforce was under contract. For years, the PBA has felt shortchanged by the city and has protested outside Gracie Mansion and even the Park Slope gym where de Blasio works out. Their relations reached the lowest point when two NYPD officers were executed in December 2014, and union leaders laid some of the blame at the doorstep of City Hall for what they described as its anti-police sentiments. But since then, de Blasio has become an increasing booster of the NYPD and its officers as the crime rates continued to fall in the Big Apple, and as the department has reduced aggressive stop-and-frisk police tactics while trying to build bridge to the communities they serve. 'We wanted to get the mayor and the staff to focus on our contract. I think it worked," Lynch said of the frequent protests. Just last week de Blasio announced that his fiscal year 2018 budget would include $10.4 million to install bullet-resistant windows in the driver and passenger side of patrol cars. The city will also spend $275 million over five to seven years to upgrade the Rodman's Neck firearms training facility. "It doesn't matter how far apart the sides are when they begin, it matters where they end up," said de Blasio who added that the PBA protest played no role in the city’s decision to work out a deal. The mayor explained that additional monies given to the police are to compensate them for participating in a "tremendous paradigm shift" to community policing, and the union's agreement to accept the use of body cameras after an initial pilot program is tested involving 1,000 officers. "This allows for a reset we need to effect this transformation," said de Blasio. The PBA also agreed to drop its lawsuits against the use of body cameras and the use of naloxone, an emergency drug used by first responders to revive those who have overdosed on opioids. Rendering the drug will now be a part of police duties and a condition of employment. Lynch said the increased salary will help attract and retain officers who look to other higher paying agencies for jobs. NYPD Commissioner James O'Neill said he was pleased that the contract had been settled. "This resolution was long overdue," he said.